December has been another busy month for the fight team at Charnchai with our Western fighters notching up some great fight experience at Loi Kroh and Kawila Stadiums in nearby Chiang Mai, our Thai fighters winning their debut fights at Channel 7 stadium in Bangkok and Bee’s son Mahamongkol fighting twice on TV in the space of a fortnight. On Friday 9th December 2016 Charnchai Muay Thai students and first time fighters Youri from Switzerland and James from Australia headed down to Chiang Mai for their matches at Loi Kroh Stadium. Youri brought high energy and great variation into the ring using leg kicks, body kicks and knees against his opponent, another Western fighter training at Team Quest in Chiang Mai. Youri’s attacking style won him the fight when he delivered a knee to his opponent’s belly and the referee called an end to the match in the second round. James’s first ever muay thai fight was a bloody battle against a slightly smaller but way more experienced Thai fighter which went five rounds and resulted in a loss for our Aussie fighter as well as an impressive war wound on his forehead which needed 14 stitches. It was a disappointing night in Chiang Mai for young Charnchai fighter Mahamongkol on Sunday 18th December 2016. After getting knocked down in round one with a hefty punch and receiving an eight count, our fighter picked himself up and showed what muay thai fighting is really about, having the heart to get back up, refocus and carry on regardless of what ever is thrown at you. Fighting at a slight weight disadvantage against Jaising Kela Sport, an experienced opponent from Nan in Northern Thailand, Mahamongkol landed lots of left body kicks, elbows and sharp knees but was thrown off balance in the clinch on several occasions and couldn’t do enough to recover the fight and get the win. It was a disappointing defeat for Mahamongkol but as always, in every fight there are valuable lessons to be learned and improvements to be made in order to come back stronger and better. Mahamongkol is a naturally talented, promising young fighter with many battles ahead of him in 2017. He will likely be heading down to train in Bangkok at Bee’s old ‘Big Boss’s’ new gym (formerly Sitthepitak Gym) along with Denmuangpai early in 2017 but plans are yet to be finalized. 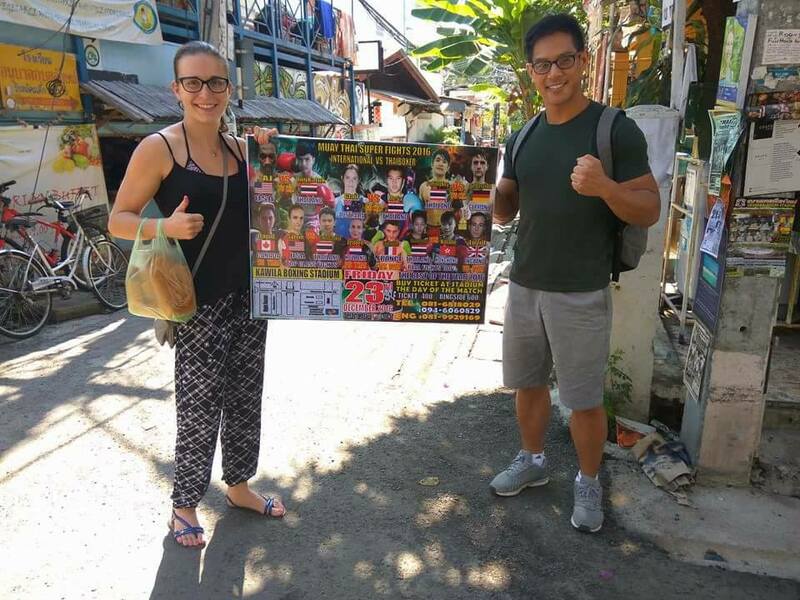 Demuangpai is currently down in Bangkok with another of Bee’s close companions from back in his fighting days (Sor.Sunton Gym at Param 3) putting in the final preparations for his match at Lumpinee Stadium on New Year’s Eve! 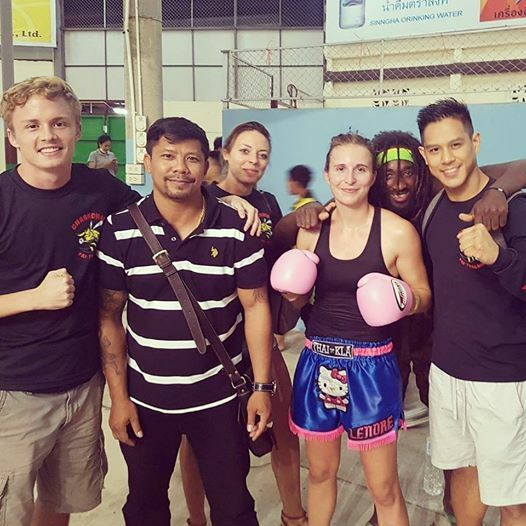 Friday 23rd December 2016 saw two more of our Western fight team members, David from Canada and Lenore from Holland, representing Charnchai on an exciting fight card at Kawila Stadium in Chiang Mai. David was the first match of the night, it was also his first ever muay thai fight, and he was matched against Thai fighter Malaiphet Sit.Dapwax. The fight was over pretty quickly with David over powering his opponent and winning by TKO in round 2. Lenore was the final match of the night and after a long wait she gave a nice technical performance with a smart, defensive style but lost against the more aggressive approach of her Thai oppnent Nongpat from Phet.Tonphueng, the all female muay thai gym in Mae Rim, Chiang Mai. Congratulations to the fighters who’ve stepped into the ring and represented the Charnchai Muay Thai fight team over the past twelve months – win, lose or draw, it’s not the results but the experiences gained and lessons learned that really matter. 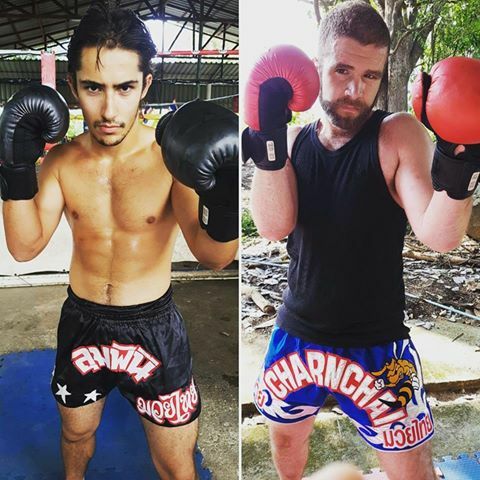 2016 has been another smashing year for our team all thanks to the interesting and eclectic characters who join us for training all year round and make our muay thai family so unique and great! Wishing you all a very happy new year and all the very best things for 2017!